This interview is part of Mozilla Labs DemoParty, an initiative to foster artful exploration of web technologies. On a recent trip to Finland, Helsinki I had a chance to meet the demo artist Visa-Valtteri Pimiä aka Visy. He is part of the “Alternative Party” crew and co-arranging “The Flame Party” in Helsinki with us. Visy has co-released impressive demos on a variety of platforms and most recently on the web. I asked him some questions. TBX: Visy, where does your immense passion for creating demos come from and how did you get sucked into this art scene? Visy: I’ve been fascinated with computers as long as I can remember. They have always been a part of my life. Growing up with technology and finding the need to express myself made me choose digital media as the platform to do it; my first steps with computers were always creative in nature, be it creating BASIC program, pictures with paint programs or tracker songs. 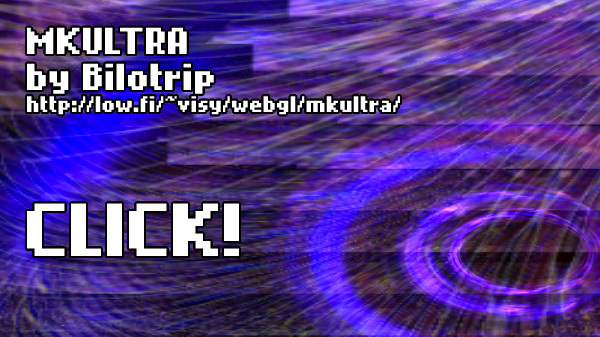 I found the demoscene through the files uploaded on Finnish BBS file sections, seeing various productions by PWP and other Finnish demo groups, and I instantly knew that this was something I wanted to do as well. In reality, it took some years of trial and error and learning from my mistakes to actually find my own way of doing creative things on the computer. The first thing I was proud of was a demo on the Nintendo NES, and I’ve never looked back since. TBX: What defines the demoscene for you? There are many traditions, but sometimes traditions need to be broken. Like making a demo interactive or moving onto a different platform. Is there something like a quintessence of the scene? Visy: The “scene” is a very loose knit collection of people. I’ve just considered it as the scene of people that like the aesthetics of demos, nothing more (in addition of the old cliques of demo creators that had to organize parties to see each other face to face!). What I mean by that is that you don’t have to be a part of any scene to be an artist. I don’t think there’s any restrictive qualities in what can be a “real” demo and what can’t. I’ve always defined it as being “mostly realtime”. Demos are the art of realtime calculation, for sure, and anybody can make them, be they part of the “scene” or not. It’s not a contest. In any case, the boundary between a digital artist and a demo artist is very fine if not nonexistent. Visy: The demo is the second part of Bilotrip’s “mind control” trilogy, a series of demos designed to evoke a feeling of something forbidden, strange and out of this world. The main source of inspiration for them are the legends of CIA mind control experiments and the stories of attempted human brain programming. I’ve tried to convey this feeling of helplessness through our work, culminating in the third part that’s still to come. Bilotrip itself is the “brand” of our demos that are more experimental and try to be something else than what already exists. It’s the shadow brother of Trilobit, the clean cut and straight edge demogroup we organized as before. It’s a sort of mirror of my personal development as an artist as well, eschewing traditions for the grueling process of finding something truly original creatively. I’m still searching for my own voice as an artist. TBX:I have to disagree – As I see it you already very much found your voice! : ) Are you considering releasing the “tool” you are working with as open source at some point, so others can build on your work, too? Visy: It’ll be on Github soon, but I think this is not the best source to learn from, as I very much compromised form for function this time, trying to get the end result done in time for the Stream 8 demoparty. But definitely I’m happy to share all and any code with people if they want. I consider my stuff always open source. TBX: Which demo you’ve worked on in the past is your favorite and why? I want to show it to the readers. TBX: I can’t wait to see more web-based demos from you, thanks for the interview and see you at the Flame Party in Helsinki! Visy: Thanks! I’ll definitely work with WebGL in the future as well, seeing that it really helps with the multi platform aspect I’ve always driven for in our productions. See you are the Flame Party!